The Viper Mark II was the Colonial Fleet's primary space superiority fighter / attack craft during the initial Cylon War. 40 years later, they are used by Galactica to effectively combat the Cylons and their more advanced fighters during the exodus from the Twelve Colonies. The Raider is the standard starfighter employed by the Cylons in the 1978 science fiction television series and movie Battlestar Galactica along with its re-imagining in the 2003 miniseries and 2004 television series. The re-imagined series also presents a new class of raider, dubbed the 'Heavy Raider'. Battlestar Galactica is a space battleship in the original and re-imagined science fiction television series Battlestar Galactica. The Twelve Colonies built approximately 120 Battlestars during their thousand-year war with the Cylons, whose own battleships are known as Basestars. Our Price: $69.99 Back Order! The Colonial Viper is a spacecraft in the Battlestar Galactica science-fiction franchise. It is the primary fighter spacecraft type used by the human protagonists in this fictional universe. Appearing in both the 1978 original series and the 2003 reimagined series, as well as various derivative works, the single-pilot spacecraft are carried aboard Battlestar Galactica and are the humans' main tools of defense against the universe's antagonists - the cybernetic Cylon race. The Basestar is the capital ship of the Cylons in the 1978 science fiction television series and movie Battlestar Galactica along with its re-imagining in the 2003 miniseries and 2004 television series. The Basestar is the Cylon counterpart of the Colonial Battlestar. The Basestar has also been called a Baseship and a Cylon Battlestar in one episode but "Basestar" conforms to the Colonial ship naming system. The Viper Mark VII is the Colonial Fleet's latest update to the venerable Viper Mark II primary space superiority fighter / attack craft. Capable of atmospheric flight, the Mark VII is the front-line variant of the Viper design, retaining the Mark II's general layout but adding fully integrated avionics that provide superior battle management and flight information for the pilot. Pegasus was a Mercury-class Battlestar and one of the most advanced military ships in the Colonial Fleet. Along with the Battlestar Galactica, the Pegasus was one of two Colonial military vessels to survive the Fall of the Twelve Colonies, serving under the command of Admiral Helena Cain. 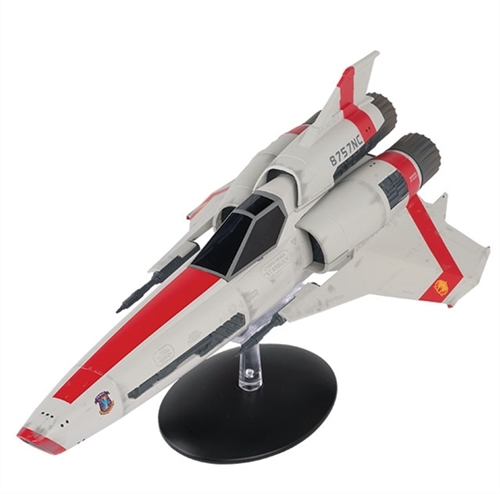 The Raider is the standard starfighter employed by the Cylons in the 1978 science fiction television series and movie Battlestar Galactica along with its re-imagining in the 2003 miniseries and 2004 television series.